Well, the Craziness has come and gone, but oh, what a ride it was!!! 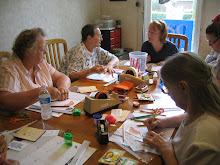 We had four and a half days of crafting fun...with bright T-shirts and even brighter smiles! I would like to thank my friends, those who taught classes; those who attended classes; and those who wished us well, for all of their support, patience and enthusiasm! Friends I would like to thank in particular include Sandy Flaitz, who managed to keep everyone fed and happy; Louise Damon, who not only taught wonderful classes, but also managed to document the entire event; Terry Peattie, who kept me on my toes and helped me every step of the way as she filled our schedule with fun mixed media projects; Nadia Peattie, who with and without Natalie, taught a class and helped every time she could; Kimmy Whitehorne, who taught quilling classes and kept everyone in "balance" with her powerful chair massages; Lori Frye, who captivated everyone with her envelope and tag book; Donna Roskey, who inspired all with her maze book; Liz Lazo, who brought a whole new dimension to our Craziness gathering with her vintage inspired works of art; Sarah Whitmire, who introduced us to her unique style of mixed media painting; Sue Carmichael, who conducted two glorious wood-carving workshops; and Shane Bowlin, who somehow managed to get all the project pictures and class descriptions posted and clarified. Without their help, the Cootie Coo Craziness event would NEVER have gone on as efficiently and joyously as it did! I would also like to thank the vendors and businesses who supported our event through their generous donations, including Janice Easton and SweetBerries of Gainesville, for a seemingly endless supply of yummy frozen custard; Marilyn Vanover and Alarion Bank for their generous donation of pens, freshly baked cookies and freshly popped popcorn; Creative Impressions for goodies for the goodie bags that included ribbon, cork paper and eyelets for all; Bazzil Paper for enough product (flowers, gems & edges) to provide goodies for each participant, Holly Berry House for four wonderful door prizes of sets of medallion stamps; SEI for its door prize of a shadow box and goodies; Stampendous for its donation of rubber stamps and assorted product; Stamps by Judith and Heather for its donation of stamps for prizes; Dianne Padgett and Lori Loskey for their donation of stamps and paper to be shared with all; and Farm House Paper for its donation of acrylic stamps. My heart is full of joy as I relive the events of our Craziness weekend and I smile as I look at all the photos of women gathering together and creating not only works of art but also bonds of friendship. Thank you all!!! Please visit both my personal facebook page (Sharon Kantor) and/or the shop facebook page (Cootie Coo Creations) and share in the excitement that you will find in the photographs of our Cootie Coo Craziness event! !